Eastman offers a family of Therminol heat-stable fluids developed specifically for indirect transfer of process heat. Eastman Therminol® heat transfer fluids can meet the operating needs of virtually any single- or multiple-station heat-using system. In properly designed systems our fluids provide excellent thermal stability within their expected temperature ranges and provide years of trouble-free service with minimum downtime. Available in various formulations and operating ranges, Therminol heat transfer fluids provide excellent benefits—economy, efficient operation, minimum maintenance, and precise temperature control. 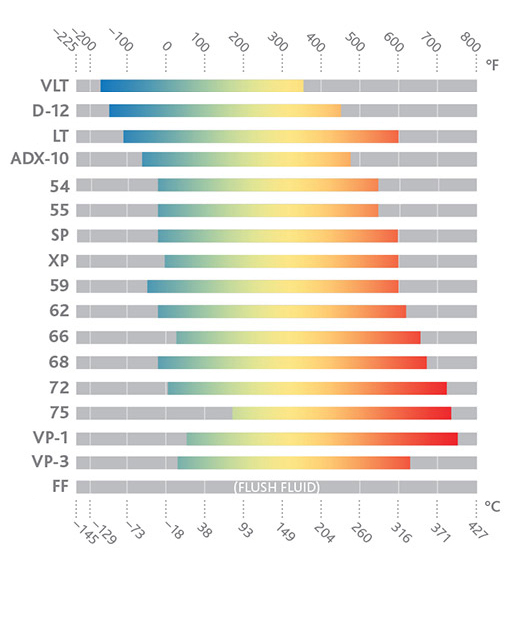 Select a heat transfer fluid from the temperature diagram below to learn more about specific product performance benefits, availability, safety data, and technical specifications. Therminol VLT is a synthetic liquid-phase heat transfer fluid with excellent heat transfer and fluid properties for extremely low-temperature applications. This fluid is ideally suited for single-fluid heating and cooling systems. Therminol 55 is a synthetic heat transfer fluid used in moderate-temperature applications. Therminol 59 is a synthetic heat transfer fluid with excellent low-temperature pumping characteristics and thermal stability. Therminol VP-3 heat transfer fluid is a synthetic heat transfer fluid that was specially developed to allow vapor-phase heat transfer at lower temperatures than are practical with traditional diphenyl oxide (DPO)/biphenyl constituted fluids like Therminol VP-1. Therminol 66 is the world’s most popular high temperature, liquid-phase heat transfer fluid. Therminol 66 is pumpable at low temperatures and offers high-temperature thermal stability. Therminol 72 is an ultrahigh-temperature liquid-phase heat transfer fluid with excellent thermal stability. Therminol 72 was developed for use at temperatures up to 380°C (720°F) in liquid-phase heat transfer systems. Therminol 75 synthetic heat transfer fluid is an ultrahigh-temperature liquid-phase heat transfer fluid with excellent thermal stability.